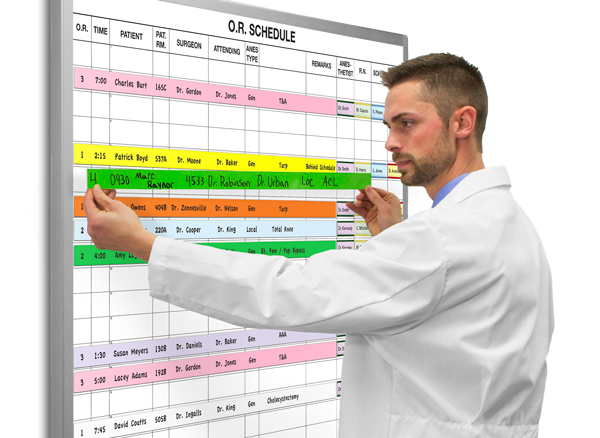 Magnatag® hospital whiteboards are top-quality, designed to stay like new for lifetime of daily hospital use. These are efficient, comprehensive and easy-to-use boards for managing hospital patient-staff communication, time, schedules, notes, patient-tracking and more. We've designed and built them from daily dialogue with hospital management since 1967. Each board kit is ready-to-use with all the carefully-selected magnets and supplies needed to operate them. To order custom-printed boards, please contact us or call one of our whiteboard specialists at 800 624 4154. No obligation. We ship factory-direct in 3 business days or less.